Bangre-Weoogo urban park in Zone du Bois is a natural preservation area and “sacred forest” dating from the pre-colonial era. Ouagadougou Cathedral, or the Cathedral of the Immaculate Conception of Ouagadougou is the cathedral of the Roman Catholic Archdiocese of Ouagadougou in Ouagadougou, the capital of Burkina Faso built in the 1930s and is one of the largest cathedrals in the western or southern African countries with The Basilica of our Lady in Ivory Coast being the largest in Africa. It is ‘a museum “open” sculpture on stone located 30 km from Ouagadougou in the village of Ziniaré . This features enormous granite slabs and displays works of over 5 continents. This has brought together over 20 African Artists to sculpt in granite rock that emerges from those parts of the works are truly unique, and the result is surprising, in a completely desolate area these rocks are seen to emerge that take the strangest forms: a bird, a pyramid, the head of a person that is visible between the cracks of a rock, etc. Since then, other artists come to this place to give free rein to their imagination. Musée de Manega or Manega Museum is a museum located 55 km (34 mi) northwest of the city Ouagadougou, in the village of Manega, Burkina Faso. Arli National Park is a national park located in south-eastern Burkina Faso.It is home to around 200 elephants, 200 hippos and 100 lion and a number of buffalos among other animals. Bobo Dioulasso Grand Mosque is the largest mosque of Sudano-Sahelian style, built in the end of the 19th century (1882) as a result of political deal between local king of Sya and Islamic religious leader Almamy Sidiki Sanou. The Rock Engravings of Pobe-Mengao are located in the Pobe-Mengao Department of Burkina Faso. Alongside the unique rock art, there exists man-made mounds as well as necropoles, millstones, and other archaeological artifacts such as metal tools. 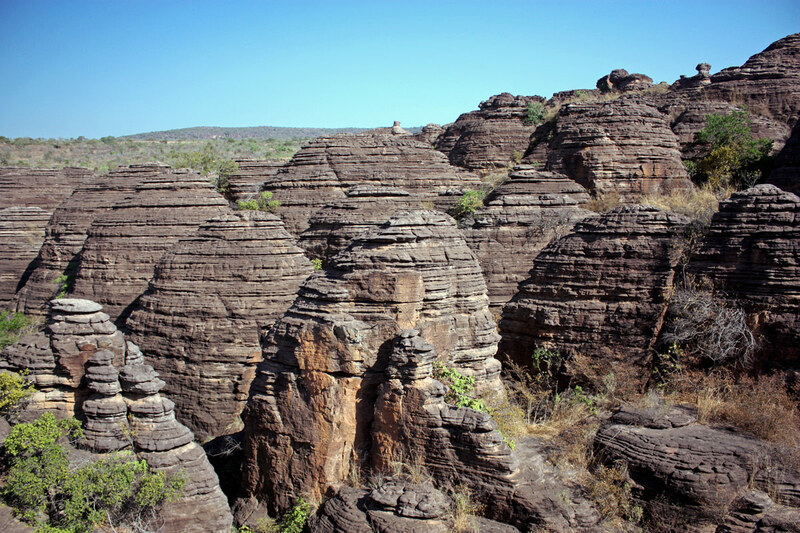 Domes de Fabedougou are rock formations located in Bérégadougou Department of Comoé Province in southern Burkina Faso. They are composed of Mesoproterzoic sandstone that is incredibly un-metamorphosed. For being 1,800 million years old (and coincidentally the same age as the much tortured Vishnu Schist in Grand Canyon) these rocks are surprisingly young looking. Loropeni is a market town in southern Burkina Faso, lying west of Gaoua whose ruins are the country’s first World Heritage inscription. Surrounded by mystery, the 11,130m2 property is made up of an array of stone walls. Loropéni is the best preserved example of a type of fortified settlement in a wide part of West Africa, linked to the tradition of gold mining, which seems to have persisted through at least seven centuries. Archeological digs have produced pottery shards, arrowheads, animal bones and various preserved botanical specimens. Carbon dating shows that the fortress may first have been built in the 11th century. Around 12km north of Banfora is the beautiful oasis called Cascades de Karfiguéla (aka Banfora Waterfalls). On the way to the waterfalls is an avenue of mango trees.